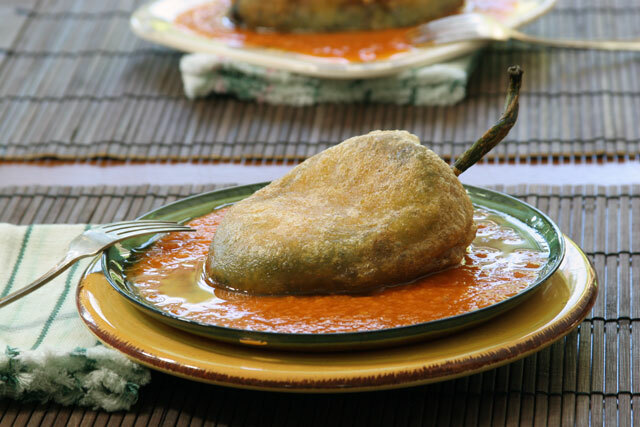 Chile rellenos are one of the best things that ever happened to this Earth. They are a bit labor intensive but so worth it. It has just a few ingredients but it turns into a flavor balancing act that is to die for! I’m keeping the intro short, the recipe speaks for itself! I adapted this from The Paupered Chef which use a Rick Bayless recipe. Charring the peppers and tomatoes: I did this on my gas grill outside. You can also char them over a gas stove flame, or in the oven on Broil high. Broil for 10 minutes or until evenly charred. This can be done ahead of time, up to three days. Store in an airtight container. Reheat when serving. 1. 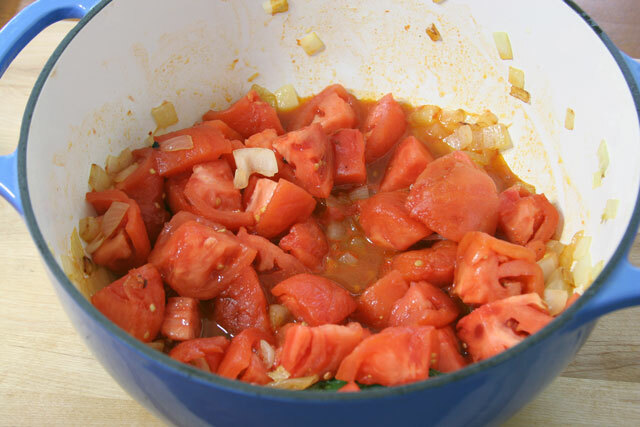 Once the tomatoes have a nice char on them, give them a rough large chop and set aside. In a large pot or dutch oven, heat 1 tablespoon of olive oil over medium low heat. Place the onions in the pot, saute for 10 minutes, a little color is ok here. Add the tomatoes, chile serrano, and garlic. 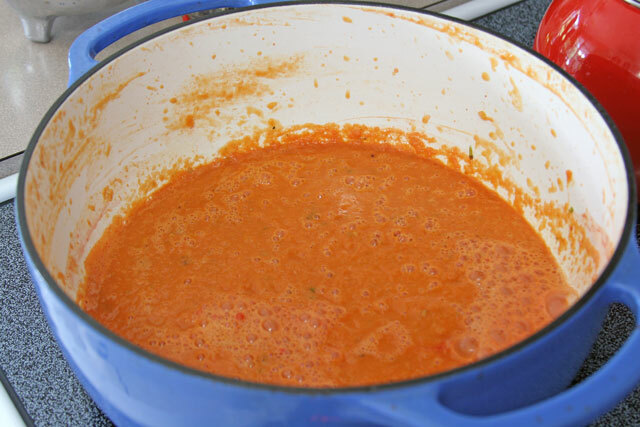 Using a hand blender, counter blender, or food processor, blend the tomato sauce and return it to the pot. Cook for 10 minutes. Add 1 teaspoon of salt and 1/2 teaspoon pepper. Taste, does it need more salt or pepper? Add to your liking. Turn off heat and let sit covered until service. 1. 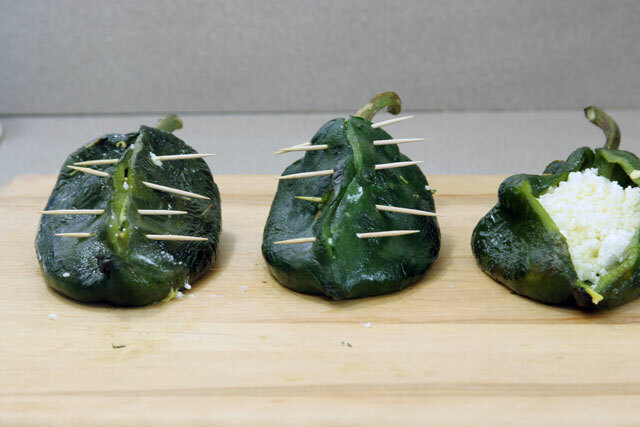 Once you have roasted the poblanos, place them in a bowl, cover with a towel, and sweat for 10 minutes. Remove skin by peeling. Cut a slice down the center of the pepper, about 2-3 inches long depending on the size of the pepper. Very carefully remove the sack of seeds that is attached to the top of the pepper, don’t worry to get them all, it is more important to keep the pepper intact than get all of the seeds. 2. Stuff the pepper carefully with 1/4 cup cheese. If it is a small pepper use less. Take toothpicks and close using at least 3-5 picks. Like below, you want the peppers to close easily. 1. 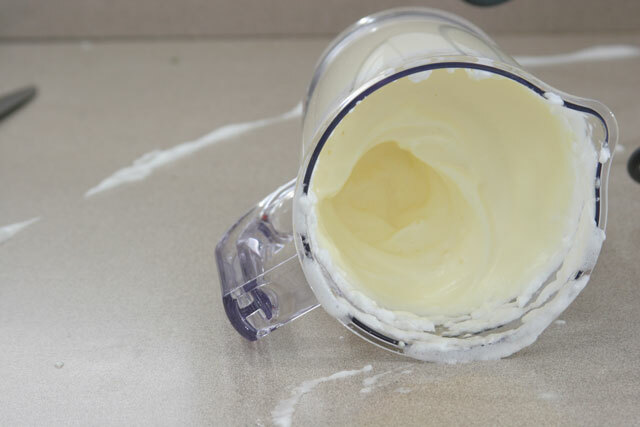 Using a hand blender or in a stand mixer with whisk attachment, place the eggs whites and whisk until stiff peaks. Add one yolk at a time on medium until incorporated well. You want a stiff mixture like below. Start heating the tomato sauce over medium/low heat. 1. 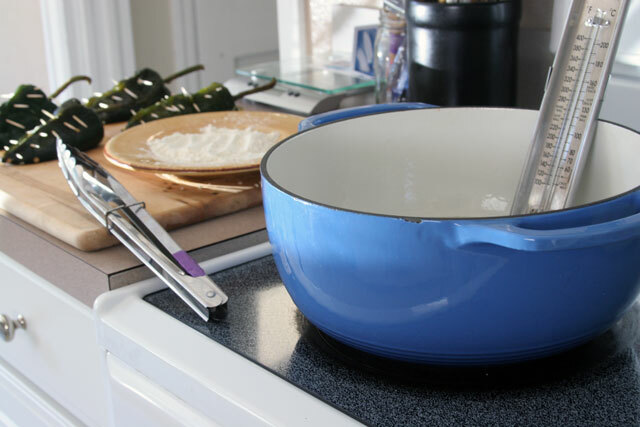 Heat the oil in a large pot or dutch oven. Place enough oil in the pot to come up a little less than 1/2 way, I used a 6 quart dutch oven with 3 cups of oil. Attach your thermometer to the pot and heat oil to 350 degrees. 2. Set up an assembly line: the stuffed peppers, next to a plate with the flour, next to the large cup of whipped eggs to dip the peppers in before frying. 3. Take the pepper place in the flour on each side, dip in the whipped eggs evenly, and gently place in the frying oil. Fry on one side undisturbed for 3-5 minutes, take the tongs and gently flip over on the other side. Fry for 3-5 minutes or until golden brown. Repeat with all of the peppers. 1. Ladle 1/2 cup of tomato sauce on a large plate and set the pepper on the sauce. I served this with a side of whole pinto beans. I used a KitchenAid 5~Speed Hand Blender for this dish, and I did a review for it, check it out!